Baptist Memorial Hospital, located in Booneville, provides excellent quality health care for Prentiss County residents. Baptist Memorial Hospital in Booneville was founded in 1949. It became affiliated with Baptist Memorial Health Care in 1982. As such, the hospital is accredited by the Join Commission. 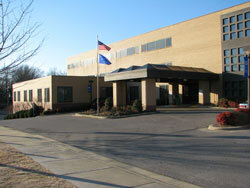 BMH-Booneville is a general medical and surgical hospital with 114 beds and 62 nurses. In 2012, BMH-Booneville had a payroll of over $10 million for its 278 employees. In 2012, the hospital had 15,044 patients visit the Emergency Department, 952 surgeries were performed, and 1,437 discharges. BMH-Booneville has an overall four star rating on Medicare.gov’s Hospital Compare service and it was recognized as a Top Performer on Key Quality Measures by the Joint Commission. It was named Hospital of the Year in 2011 by the Mississippi Nurses Association. The 24-hour Emergency Department at BMH sees around 23,000 patients each year. It has 10 beds and provides ultrasound services, CT scanning, X-ray, respiratory and select radiologic procedures, and a 24-hour lab. The Baptist Memorial Hospital has three specialty clinics focusing on ophthalmology, neurology, and orthopedics. Visit the Prentiss County Health Department website. Part of North Mississippi Primary Health Care, Inc. (NMPHC), the Booneville Community Health Clinic is a private-nonprofit organization. Located at 208 North First Street in Booneville. Region IV Mental Health Services operates an out-patient facility in Prentiss County at 2100 East Chambers Dr. in Booneville.